SpaceX has named Japanese billionaire entrepreneur Yusaku Maezawa as the first paying passenger for the company’s ambitious 2023 moon mission. SpaceX CEO Elon Musk, himself a billionaire entrepreneur, named Maezawa at a special event at the company’s headquarters in Hawthorne, California, on Monday night. While the five-day round trip will involve a fly-by of the moon rather than a landing, it’ll still be the first lunar trip since 1972, when the last U.S. Apollo mission took place. If all goes to plan, Maezawa will become only the 25th person to make the journey. The 42-year-old businessman (below), who made his fortune after launching an online fashion mall that became the largest in Japan, will make the journey aboard SpaceX’s Big Falcon Rocket (BFR), which is scheduled for testing next year. “For me, this project is very meaningful,” Maezawa told the gathered crowd shortly after Musk introduced him. 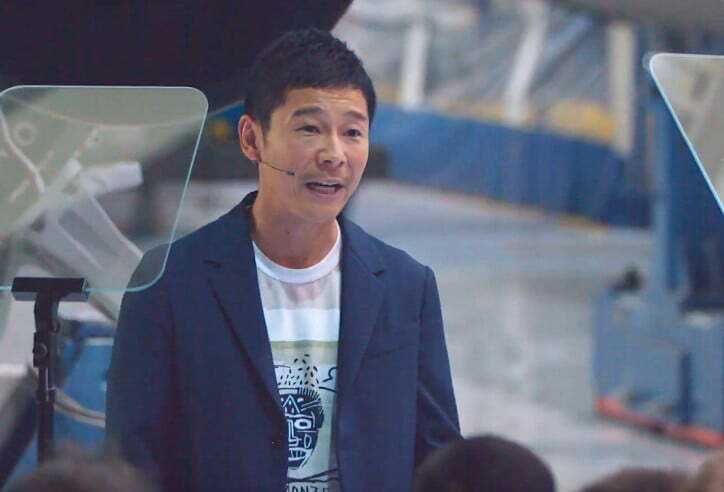 Maezawa said that he’s bought all the seats on the BFR — cost unknown — so that he can take up to eight artists with him on the one-off mission. That’s right — he plans to take top musicians, fashion designers, painters, and other artists along for the ride. He hasn’t revealed who he’s going to invite, but it’ll be fascinating to see who he has in mind, and even more interesting to find out who does or doesn’t take him up on the offer of a free trip to the moon. Maezawa is reportedly worth almost $ 3 billion and is listed by Forbes as the 18th richest person in Japan. The entrepreneur started out selling CDs and records of his favorite bands by mail from his home before launching online fashion mall Zozotown in 2004. Modern art is one of his passions, too, and in 2016 he spent around $ 80 million on paintings by Jean-Michel Basquiat and Pablo Picasso. Whether the bold mission takes place now depends on SpaceX successfully testing the rockets and other equipment in the coming years. It’s worth noting that this isn’t the first time SpaceX has announced a plan to send paying passengers to the moon. In 2017, the private space company revealed that two moneyed individuals had paid a “significant” deposit for the same moon trip. Elon Musk never offered any detailed information about the identity of the pair, saying only that they were not Hollywood stars. The trip was set to take place toward the end of this year, but was scrapped when SpaceX decided to switch the plan from its Falcon Heavy rocket to the more powerful BFR. Maezawa and his traveling companions will have to be happy with that risk, too.